The sea formed upon separation of the North American Plate and Greenland Plate that started about 60 million years ago and stopped about 40 million years ago. It contains one of the world's largest turbidity current channel systems, the Northwest Atlantic Mid-Ocean Channel (NAMOC), that runs for thousands of kilometers along the sea bottom toward the Atlantic Ocean. The Labrador Sea is a major source of the North Atlantic Deep Water, a cold water mass that flows at great depth along the western edge of the North Atlantic, spreading out to form the largest identifiable water mass in the World Ocean. The northern and western parts of the Labrador Sea are covered in ice between December and June. The drift ice serves as a breeding ground for seals in early spring. The sea is also a feeding ground for Atlantic salmon and several marine mammal species. Shrimp fisheries began in 1978 and intensified toward 2000, as well as cod fishing. However, the cod fishing rapidly depleted the fish population in the 1990s near the Labrador and West Greenland banks and was therefore halted in 1992. Other fishery targets include haddock, Atlantic herring, lobster and several species of flatfish and pelagic fish such as sand lance and capelin. They are most abundant in the southern parts of the sea. Beluga whales, while abundant to the north, in the Baffin Bay, where their population reaches 20,000, are rare in the Labrador Sea, especially since 1950s. The sea contains one of the two major stocks of Sei whales, the other one being the Scotian Shelf. Also common are minke and bottlenose whales. The Labrador Duck was a common bird on the Canadian coast until 19th century, but is now extinct. Other coastal animals include the Labrador Wolf (Canis lupus labradorius), caribou (Rangifer spp. ), moose (Alces alces), black bear (Ursus americanus), red fox (Vulpes vulpes), arctic fox (Alopex lagopus), wolverine, snowshoe hare (Lepus americanus), grouse (Dendragapus spp. ), osprey (Pandion haliaetus), raven (Corvus corax), ducks, geese, partridge and American wild pheasant. Here's the our members favorite photos of "Sea in Atlantic Ocean". 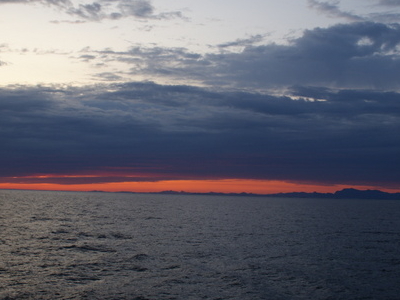 Upload your photo of Labrador Sea!